NEW YORK, Sept 23 (APP): Pakistan’s economy is back on an upward growth trajectory, with liberalized investment sector and improved security environment generating enhanced investor interest, Prime Minister Muhammad Nawaz Sharif told US business and industry leaders on Thursday. “Our economic rebound is particularly remarkable because we achieved it while being engaged in major counter-terrorism operations that we have launched against terrorists across Pakistan,” he said in a speech at a luncheon co-hosted by the US-Pakistan Business Council (USPBC) and the US Chamber of Commerce. “Thankfully, we have been able to restore the writ of the State and reclaim every inch of our territory,” the prime minister said. “Being a firm believer in the private sector’s pivotal role in the economic development of Pakistan, my government has framed policies aimed at providing an enabling environment for private, local and foreign businesses to thrive,” he told his audience. “Already the Investment Policy 2013 provides one of the most liberal investment regimes in the region, allowing 100% foreign ownership with emphasis on reducing costs and processes involved in “doing business” and creating linkages for trade and industry. The United States, he said, has remained an important economic and trading partner of Pakistan, but the level of trade and investment between the two countries has not kept pace with global trends. Recognizing this, he said during his meeting with President Barack Obama in October 2013, they agreed to jointly work on developing a Joint Action Plan to expand bilateral trade and investment flows over the next five years. There was tremendous potential to deepen trade, economic and investment cooperation between Pakistan and the United States. “Your role as business leaders, investors and entrepreneurs is critical in enabling our two governments to fully harness the potential”. the prime minister said as he enumerated the progress made by his government over the past three and half years. “As a result of bold economic reforms, my Government has achieved significant improvement in all major economic indicators. Pakistan’s growth has increased and the budget deficit has been reduced,” he said. “With a young and vibrant population of 200 million, growing consumer demand, as well as a stable economy and improved security, Pakistan today offers enormous opportunities for profitable investment and trade. Inflation is now well below 3% – the lowest in 47 years; The State Bank of Pakistan in its Monetary Policy Decision announced in May 2016 decreased the discount rate to 5.75% – again lowest in last 4 decades, and Up-gradation of the Karachi Stock Exchange to Emerging Market Index by Morgan Stanley Capital International (MSCI) is an important development. “There has also been a successful revival and resumption of the strategic private sector participation programme,” he told the businessmen.The government has also successfully auctioned 3G and 4G spectrum licenses, opening vistas of communication and data transfer in the country. Pakistan, he said, will shortly graduate from the IMF Programme. “The successful completion of the IMF programme, the second time in our history, is a strong indicator of the health of Pakistan’s economy and the authenticity of reforms undertaken. “ The Tax to GDP ratio had gone up to 12.5% which is up from 9% when the government took reins of the economy. The Karachi Stock Exchange being one of the best performing Stock Markets in the world closed Financial Year at 37,783 point, he said. It was now trading well over 40,500 points. Forbes has acknowledged that Pakistan has the potential to be a global turnaround story and ought to be a US strategic partner, the prime minister said. Jim O’Neill of Goldman Sachs had included Pakistan in N-11 or Next 11 Group of economies expected to register rapid growth in the next decade. Bloomberg ranked Pakistan: (a) 3rd amongst top ten Best Performing Markets in 2014; and (b) 14th amongst top potential investment locations in 2016. “The well reputed international credit rating agencies, international financial institutions, and international economists have all appreciated the important strides we have made over the past three and a half years in turning around Pakistan’s economy. Both S&P and Moody’s have upgraded Pakistan’s credit rating from stable to positive. Fitch has also assigned a stable rating to Pakistan. The prime minister said as a result of the comprehensive strategy adopted by the Government, energy supply, at least for the industry, was much better than before and will improve further, as key power projects in the pipeline were operationalized. “There are no power outages for the industrial sector for the last 12 months and we are well on course to eliminate all kinds of power shortages by end of 2017,” he said. The Prime Minister also drew attention of the business community to his government’s people-centered initiatives and development agenda,that offered enormous investment opportunities to international investors. 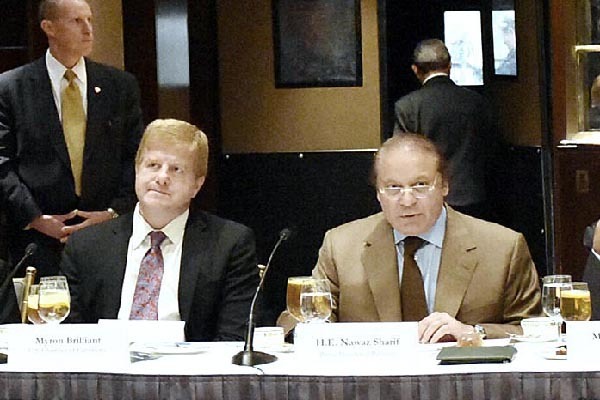 Prime Minister Sharif invited business and industry leaders to seize the moment in availing the tremendous new possibilities and opportunities that existed in the country towards enhancing the economic content of Pak-US bilateral ties. Boeing Director international operations and policy expressed his desire that Boeing wants to partner with PIA and ready to offer 777 and 787 planes for PIA Premier Service through transparent and competitive process. President selling and marketing operations of P&G said that the company has already achieved 20 percent increase in its growth in Pakistan; we are ready to further invest US $100 million in Pakistan. Vice President Philip Morris termed the current budget as business and investor friendly, and said that his company wants to engage with Pakistan for business. Chairman APR Energy said that they are ready to install 350 MWs gas power plant in Pakistan if attractive tarrif is offered to them. Besides Executive Vice President of US Chamber of Commerce, Senior Vice President of US Chamber of Commerce and President USPBC, Vice Chairman Pepsi Co, senior vice president Motorolla Solutions Inc., chairman APR Energy, vice chairman corporate and investment banking, Citi, Director motorola solutions, vice president Philip Morris, director international operations and policy of Boeing Company were among prominent attendees.